Left-arm spinner’s second five-for of the match powers host to first ever Test victory over Australia by 20 runs. 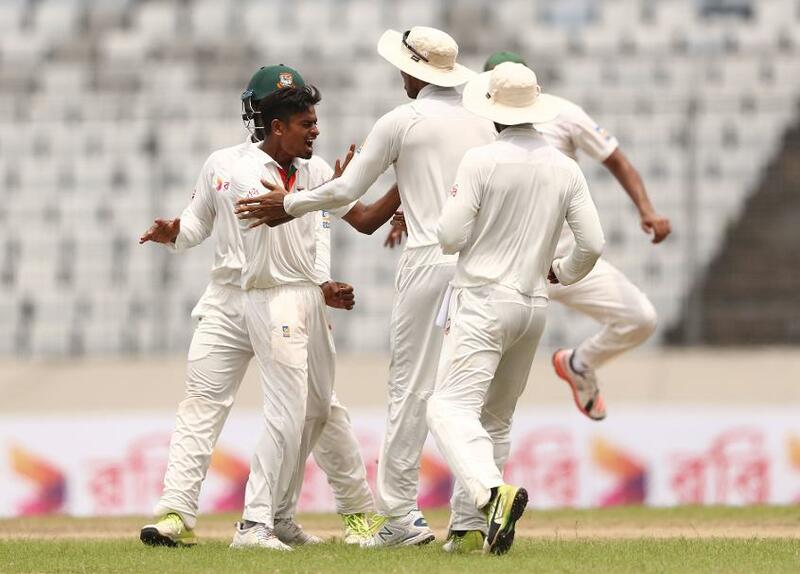 Shakib Al Hasan completed a remarkable match in which he took five-wicket hauls in each innings to go with scores of 84 and 5, spinning Bangladesh to a first-ever Test match win against Australia on Wednesday. Set a target of 265, Australia was bowled out for 244 in 70.5 overs, losing by 20 runs to go 1-0 down in this two-Test series. Shakib took 5 for 85, including the key wickets of David Warner (112) and Steven Smith (37), after the Aussies had begun well in the morning. Shakib’s triple strike brought Bangladesh back into the game after Warner had resumed on his overnight 75, still batting positively. He reached his century off 121 deliveries and Australia had progressed to 158 when Shakib struck, trapping the mercurial opener lbw for 112 off 135, which included 16 fours and a six. Four overs later, Shakib had Smith edging to Mushfiqur Rahim behind the stumps and Australia suddenly looked wobbly. That was only compounded by Shakib getting Matthew Wade and Taijul Islam chipping in with the wickets of Peter Handscomb and Ashton Agar, as the tourists reached lunch on a precarious 199 for 7. Glenn Maxwell’s stumps were broken on the first ball after the interval to give Shakib his fifth wicket and swing the game irrevocably towards Bangladesh. The tail resisted, but Taijul (3 for 60) took his third wicket by trapping an injured Josh Hazlewood palpably in front to seal the win about an hour after lunch. While Shakib was the wrecker-in-chief, he found an able spin partner in Taijul Islam who finished with figures of 3 for 60 as Australia fell short by 20 runs. "It's a great feeling beating Australia, and I think it was a great effort by the boys, especially Shakib," said Mushfiqur Rahim, the Bangladesh captain, of Shakib. "Our performance in home conditions has been pretty consistent and against England also we were very close in the first Test and we beat them in the second Test. "That's the belief we had and also our spinners did a great job," he added, saying Bangladesh would now be looking to seal the series. Meanwhile, Smith said his men could have performed better with the bat in the first innings when they scored 217. "It was a great Test match. Credit to Bangladesh, the way they played," he said. "The first innings, I thought the partnership between Shakib and Tamim really set the game up for them. I thought we fought back really nicely after that. "We probably let ourselves down a bit in the first innings with the bat. We probably needed to make a few more there." Australia - who is touring Bangladesh for the first time in more than a decade - is currently ranked fourth to Bangladesh's ninth in ICC Test rankings.